Sana’a – Due to the ongoing offensive, IOM, the UN Migration Agency, has been forced to postpone its voluntary humanitarian return assistance to migrants stranded in Hudaydah until further notice. The same military operations have, so far, caused 5,775 Yemenis to flee their homes in the Hudaydah area since it began last Wednesday (13/06) – this figure is set to increase over the coming days. “A few weeks ago, it was almost unimaginable that the situation in Yemen – already the world’s worst humanitarian crisis – could have deteriorated even further to the extent that the military offensive on Hudaydah has caused,” said Sarat Dash, IOM Yemen Chief of Mission. “We call on all parties to the conflict to show respect for human life, whether they be Yemeni nationals or a migrant caught in the conflict,” he added. 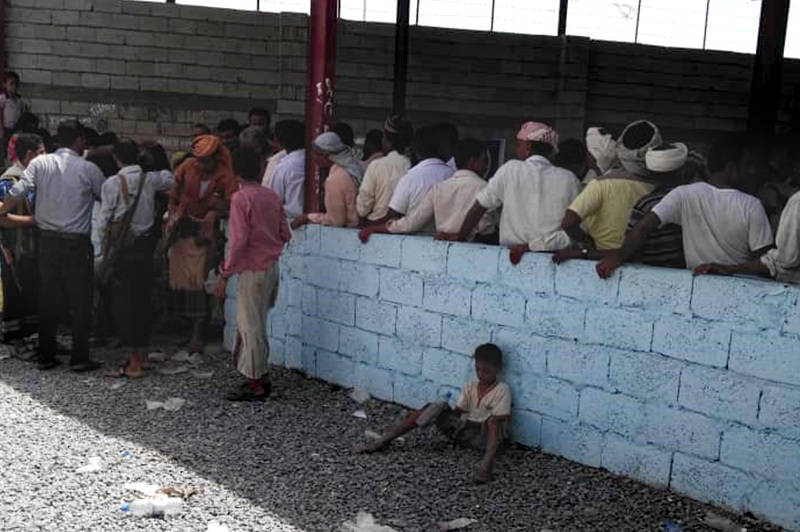 Last Thursday (14/06), IOM cancelled a voluntary humanitarian return operation that would have helped over 200 migrants get home from the warzone via Hudaydah port. In addition, an unknown number, but estimated to be in the thousands, of migrants are stranded in or near the frontlines. 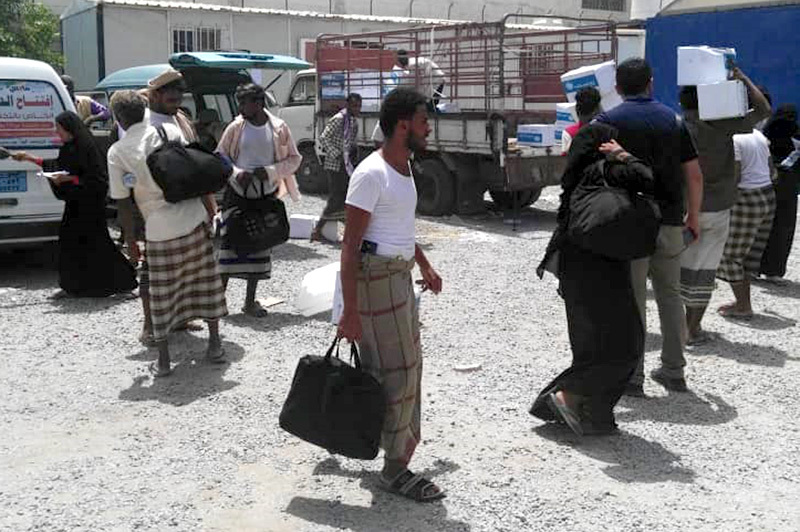 Following heavy shelling and air strikes near IOM’s Migrant Response Point (MRP) in Hudaydah, 22 migrants were immediately evacuated to Sana’a, where they are currently housed with foster families. They have been traumatized by the experience and IOM counsellors are working closely with them. In 2017, IOM helped 2,860 migrants return home from Yemen, of whom 746 migrants were voluntary returnees through Hudaydah port – the majority of whom were Ethiopian migrants but others included Sri Lankans, Indians, Nigerians and Pakistani migrants. So far in 2018, IOM has assisted over 430 migrants with return assistance via Hudaydah port. It is unknown how many migrants live or are transiting through Yemen but IOM estimates that approximately 100,000 entered the country in 2017, mostly en route to the Gulf countries. "Voluntary humanitarian return is a lifeline for many migrants, who become stranded in Yemen, without it migrants are forced to spend longer in a warzone putting their lives at great risk and causing undue distress to people, who have typically already suffered enormously," said Dash. The rising displacement caused by the offensive is in addition to the over 89,000, who were already displaced in the Governorate prior to the current military offensive. Humanitarian partners are preparing a response for 60,000 internally displaced households (approximately 420,000 individuals) through 12 Humanitarian Service Points and Transit Sites – this includes new and old displacements. Due to the increasing displacement, IOM's Migrant Response Point (MRP) has become a centre, not only for comprehensive support to vulnerable migrants, but for humanitarian assistance to internally displaced Yemenis – the largest of its kind in the area at the moment. So far, IOM and partners have provided food, cash assistance, transport, health care and psychosocial support from the MRP to nearly a thousand individuals. “Many displaced people I have met are extremely distressed from being caught in the offensive and most, who arrive at the MRP, are extremely hungry, having often gone without meals for days,” said Alisher Makhkamov, who is overseeing IOM’s operations in Hudaydah as part of an inter-agency team, which includes representatives from UNICEF, UNHCR, WFP, WHO and IOM. In addition to four medical staff that IOM has provided to three health care facilities in Hudaydah, IOM deployed a mobile medical team in an ambulance and staffed with one doctor and three nurses to Hudaydah to meet the emergency healthcare needs of affected populations. A second mobile health team and five ambulances will be deployed in the coming days. “The safety of our staff is paramount, and we urge the parties to the conflict to create a space for humanitarians to operation safely, ensuring that they have access to the populations that they are putting their lives on the line to assist,” said Dash.